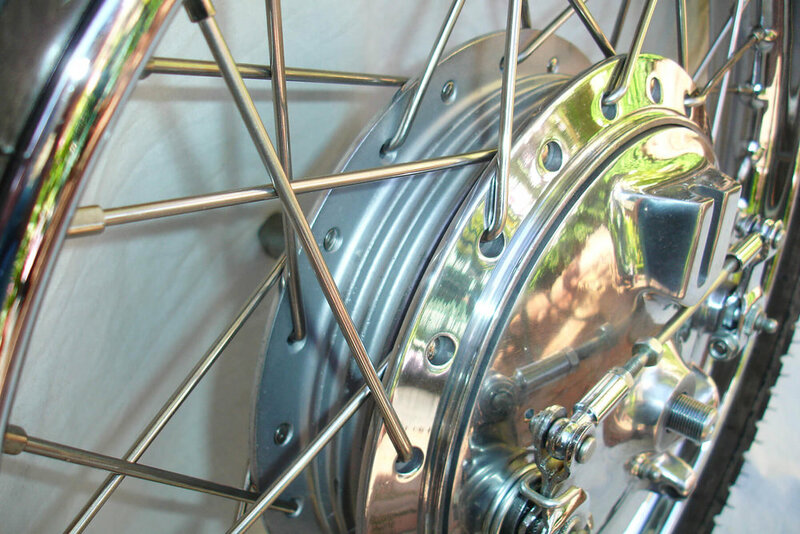 Finishing or polishing, electroplating, painting, powdercoating and hydroblasting. I have a great range of contacts for these processes. The most important thing is that I supervise and oversee each stage to make sure the finished product comes out to a high standard. I have been working with all my outside contacts for many years and we all have a good understanding and expectation of each other. This is a cabinet with a compressor to work as a suction unit which enables glass bead or garnet media to clean and etch parts ready for painting, polishing or achieving a bright finish. All the alloy hubs, steel hubs and components I restore go through this process prior to being worked with. Check out the video on the right. Phil De Gruchy on bead blasting. I can arrange this process for you. It gives a very nice result and gives a great shine to rough-cast surfaces. It is a specialist process and a step up on general blasting. I send most of my polishing to the specialist and only handle the small straight forward jobs or touch ups. My polisher does a fantastic job. I do all the cleaning and initial prep to make his job easier and liaise with him to ensure the final result is of a high standard. Polished and satin blast finish. This is also sent out to a specialist. This is mainly chrome and zinc but occasionally I arrange for nickel, copper black zinc, gold or whatever is needed for the job. Like the polishing, I do all the prep and cleaning to make the electroplaters job easier. It’s a very specialised trade and I am quite proud of the results that are being achieved on behalf of the customer. 1. Before cleaning and blasting. 3. Zinc plated and complete. 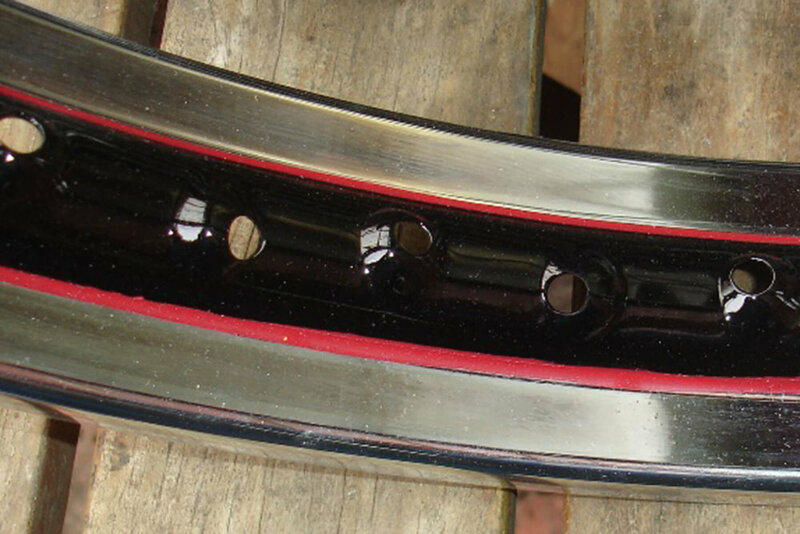 Matchless front brake backing plate. Wide Fatass Harley Davidson rim 18"dia x13" wide. This is also sent out to a highly professional painter who does very nice work. My painter can paint in straightforward colours and clear over base. He can also hand pin-stripe rims and tanks. Centerline black with gold pin stripes. Pin striping to suit original specifications. I am very proud of the results that are coming from my Powdercoater. Same as before, I do all the prep and cleaning to ensure the process runs smoothly. Powdercoating is a straight forward process but to get great results that look like the older baked enamel finishes, it takes time and skill. My own bikes are mainly powdercoated on the ancillary items and look just like they did in the 1950’s, 60’s and 70’s. The life span of the finish is important too, I am yet to see any problems from jobs that I arranged almost twenty years ago. Gloss black powdercoating on complete wheel. 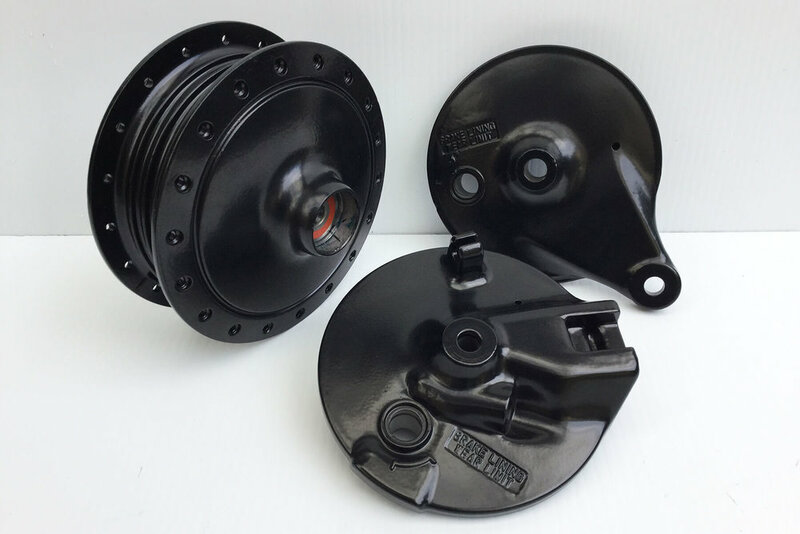 Satin black powdercoating on brake drum and backing plates. Gloss black, showing the detail of finish.